EMI Columbia Records stereo SAX 2524. First blue and silver label disc pressed in England. Laminated flipback sleeve. 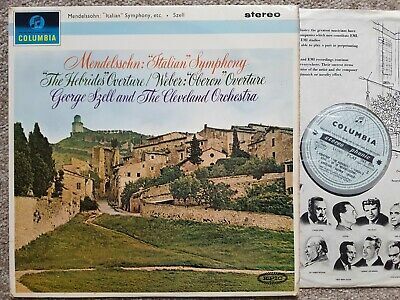 Mendelssohn, Symphony #4, "Italian", and "The Hebrides" Overture. Weber, Oberon Overture. George Szell conducts the Cleveland Orchestra. VINYL : near mint SLEEVE: excellent minus....some light usage. LPs are graded VISUALLY.... under strong light. mint this means the sleeve is still sealed and has therefore never been played. near mint means the vinyl will have no visible marks or hairlines. The sleeve/box will appear perfect as when new. It may look unplayed. excellent means the vinyl will still look good but with perhaps a couple of very light hairlines or finger marks etc.... the sleeve will have perhaps some ringwear and smudges but no tears or stains. excellent minus means the vinyl will have signs of playing and hairlines or minor marks but nothing that should affect play significantly.There will be no deep scratches.The sleeve may have ringwear or small stains or tears. If VG+ or VG then all faults on vinyl and sleeve will be described. Some buyers have said that my listing says"May not ship to Japan". This not correct...I post worldwide.